Today it was Papers We Love, my favorite meetup! Today Suchakra Sharma (@tuxology on twitter/github) gave a GREAT talk about the original BPF paper and recent work in Linux on eBPF. It really made me want to go write eBPF programs! I wanted to write some notes on the talk here because I thought it was super super good. To start, here are the slides and a pdf. The pdf is good because there are links at the end and in the PDF you can click the links. Before BPF, if you wanted to do packet filtering you had to copy all the packets into userspace and then filter them there (with “tap”). But why were the filtering algorithms inefficient! Well!! Then if you have ether.type = IP and ip.src = foo you automatically know that the packet matches host foo, you don’t need to check anything else. So this data structure (they call it a “control flow graph” or “CFG”) is a way better representation of the program you actually want to execute to check matches than the tree we started with. (it looks different from that but it’s basically the same). There’s a nice description of the virtual machine in the paper/slides so I won’t explain it. when packets come in, Linux runs the native code to decide if that packet should be filtered or not. It’l often run only 100-200 CPU instructions for each packet that needs to be processed, which is super fast! eBPF programs can’t access arbitrary kernel memory. Instead the kernel provides functions to get at some restricted subset of things. You can pick a function (any function!) in the Linux kernel and execute a program that you write every time that function happens. This seems really amazing and magical. This basically declares a BPF hash (which the program uses to keep track of when the request starts / finishes), a function called trace_start which is going to be compiled into BPF bytecode, and attaches trace_start to the blk_start_request kernel function. So I sort of knew you could attach eBPF programs to kernel functions, but I didn’t realize you could attach eBPF programs to userspace functions! That’s really exciting. 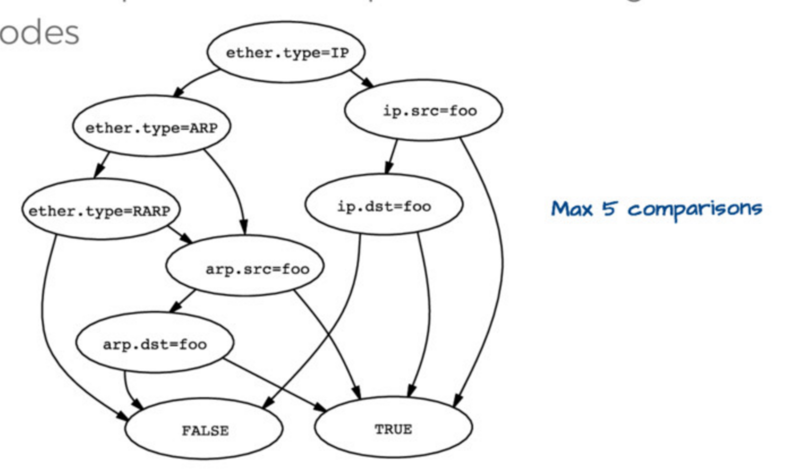 Here’s an example of counting malloc calls in Python using an eBPF program. There are a bunch of great links in the slides and in LINKS.md in the iovisor repository. It is late now but soon I want to actually write my first eBPF program!